Hey there CP oh here and we're at twilight hours because no jeep project would be complete if it didn't start in the daylight and end it dark. I've been working on rewiring the second head unit and making some upgrades adding XM satellite radio adding in a really hopefully interesting switching system for three cameras. Before it gets too dark let me show you at least where I'm at. You can see sort of the progress and then I'll show you the finish sort of result. All right. Here I am of course everything is still out and a mess it was actually a lot worse while I was wiring as a matter of fact here's a photo of what it looked like about midway through as you can see I have sort of a lot going on. I made some I made some modifications to my switches pretty much. I took off my roof mounted light bar and even though you see there's a switch here the switch label says that but it's actually no longer what it does it's now a three position switch which I'll explain but that's four cameras. I have to order a new rocker whenever I decide what I want to say on it but my bumper light bar and my rear lights all still function as do my halos both it's a three position ignition off and then on always and then my winch of course works with the N out in my fighter jet toggle switch. That's what I took apart to do I have a lot of wiring in there that controls things but as we roll it up one of the things I added into that sorry for the bright light. This is the camera switch module. 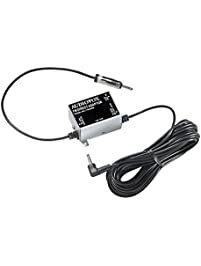 Somebody on YouTube turned me on to this which was really awesome it basically is a relay box which I was planning on doing manually building it but I didn't realize somebody had already sort of had a plug-and-play one. It'll take three inputs and send them to one output and then it uses 12-volt positive wire feeds there's a see here there's a purple wire here and a red wire here. One of the cameras will be on default that'll be the front camera Center and then if I flip the switch one direction it feeds the red which engages the second camera and if I flip it down it'll engage the purple which will engage the third camera and that'll be the output I also have wired into that same switch the camera power. That cameras won't be powered on 24/7 they will come on when the switches engage that way they're just not sitting there running hot the entire time when they're not being used. That's sort of what's going on there I'd like to explain more but I haven't even tested it yet I just wanted to get it all wired up and then I'll start playing around with adding the cameras what I also did is added in XM satellite. You can see here I have a serious module here but that is for the touch commander here's the actual unit itself that's gonna plug into there I haven't quite figured out where I'm at this but that's. Okay, it's just a simple like USB style connection with a lot of cables. I can figure that out later but I wanted to get the actual power module and that's actually the control module in here the receiver and everything. This has accessory power battery power a dimmer wire which will adjust the illumination of the display based on the dimming of the lights inside and also has the satellite antenna which I explained here in a second as well as two outputs one output is a regular like 2.5 millimeter stereo output and then the other one is one that plugs into the FM radio and forces the feed through there I'm not positive which one of those I want to do I'm gonna start with the 2.5 millimeter and then I have a splitter here don't worry all the links to these products will be in the video description. You can find out what I'm using here but this splitter basically takes a 2.5 millimeter stereo and bumps it to RCA's which I can then plug in to the back of this akane got an auxilary audio left right and then a video. 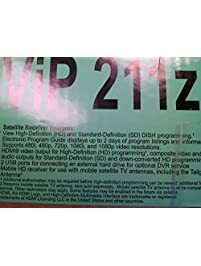 I'm going to use the left/right auxilary or the satellite see how that works if I don't like that then I can plug in the other thing which comes with the receiver which pushes it into the am/fm radio. Like I said I'm still sort of experimenting here but I want to show you where I'm at. 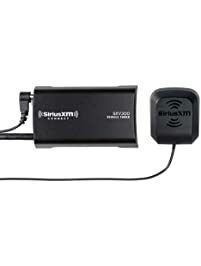 For the antenna the Jeep's 2015 a lot of the newer jeeps I'll remember what your started but the late 2010 zish jeeps maybe 2013 and newer um have a dual XM satellite and GPS antenna which means the the wire can be used for both. I plugged it into the say cane earlier which gave me GPS signal but now I need that same antenna because I don't want to run a new antenna I want the XM out of that. I found this splitter that will allow me to split that signal. One side the XM is getting and then the other side they say Kane will be good for the GPS. It's just as simple I guess it's not simple but it's a satellite signal splitter. That should be interesting and then I have another adapter cable which is this one here that takes that splitter would be the same one I just used I would use if I went straight from the XM satellite antenna into the Sirius XM receiver is I need this little adapter to convert this square plug to their round plug anyway, all these things are down in the description if you want to try any of them out see what else do I have going on here oh I did finally decide to go ahead and pull out to that extension for the SD card it's right here plugged into the back in the SD card slot see that it plugs in right there where the SD card goes that's quite a long extension actually. I actually have no problem rounding it off here to the side and coming out on the side of the globe box I'll double stick tape it somewhere alternatively I thought I could just you know tape it up here. I have access from from the top cubby area but either way that extension does work I hope I haven't actually tried it but that's where it goes that's what it's designed to do it. One last thing I want to point out before I let you go and then start button in this thing back up is I've seen a few people who have been curious about this little slot right here on the side and whether or not that is an SD card slot I can tell you unequivocally without doubt that is not an SD card slot as a matter of fact if you look here there's nothing behind it it's just it's just an empty hole. It's quite possible that they may have had it provisioned for an SD card slots depending on what hardware went in but there is no hardware to accept an SD card in there. Sorry folks those of you that saw that slot and we're wondering please do not push an SD card in there it will not work. Anyway, that's where I'm at right now I'm gonna button all this up I'll do another video later sort of showing you the final results but yeah welcome to boi tests meter and a lot of crimping and soldering but I'm pretty close to to be in awesome anyway, thanks for watching I'll catch you.